WOOSTER, OH — GEOL 220 (Introduction to GIS) had their final exam this morning, but it was not a typical final exam atmosphere. It was a very social event, with much mingling and chatter (in between bites of donut holes and muffins). This semester, the students took their last GIS exam/quiz a few weeks earlier, so that they could concentrate on individual projects for the remainder of the semester. The class was full of amazing project ideas that spanned many majors on campus. Student interests (which mirrored the many majors) included: geology, archaeology, biology, chemistry, political science, history, sociology, anthropology, and urban studies. After writing a project proposal, students spent the last few weeks of the semester analyzing data and finalizing their projects into posters. 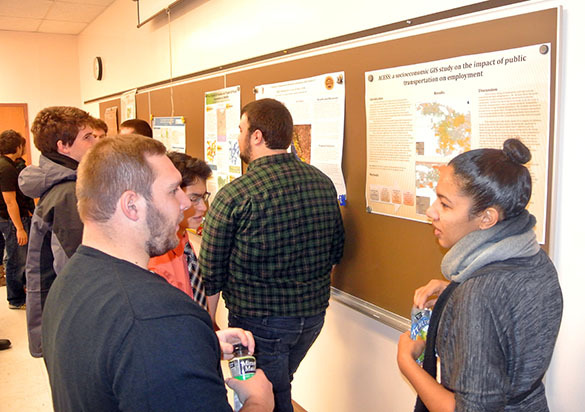 Their posters were presented during a “GIS Poster Symposium”, which was held this morning in Scovel Hall. The goal of each project was to identify a problem that could be solved spatially using the GIS mapping skills that they learned this semester. Above, Andy Nash (left, ’14) and Simon Doong (’15) are listening to Candy Thornton (right, ’14) talk about her project, which was inspired by Toure, a speaker at Wooster’s 2013 Forum Series called “Facing Race”. Candy investigated the intersection of public transportation, unemployment, and ethnicity in Los Angeles County (CA). 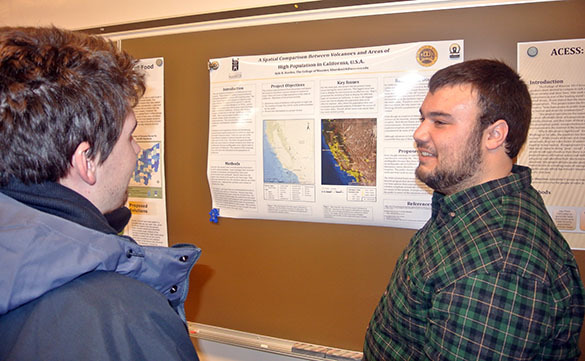 Owen Yeazell (left, ’14) listens as Kyle Burden (right, ’14) discusses his project on natural hazard mitigation: the spatial comparison between population centers and volcanic centers in California. 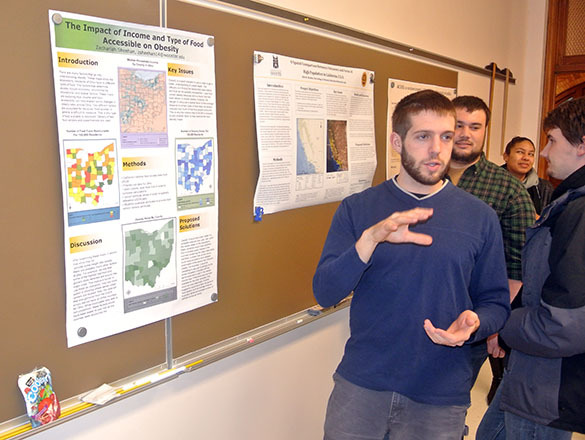 Scott Kugel’s (left, ’14) poster is directly related to his I.S. research and an offshoot of his experience this past summer as a member of a Keck Geology Consortium project. 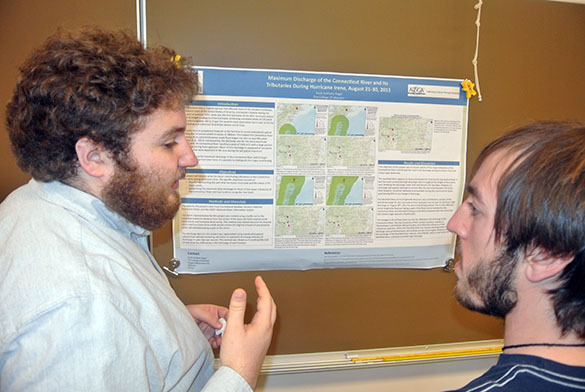 Scott is intensely explaining his analysis of Connecticut River discharge during Hurricane Irene to Cameron Matesich (right, ’14). Zach Sheehan’s (above, ’14) 2013 summer internship/experiences peaked his interest on food deserts and food accessibility issues in Ohio. He translated that to a project that analyzed Ohio median household income (by tracts) fast food restaurants, number of grocery stores, and obesity. I am very proud of all of the GIS work this semester. Not only did the students do a wonderful job presenting at the GIS Poster Symposium today, but in recent weeks, they also learned to navigate data problems and mysterious software issues along the way! !